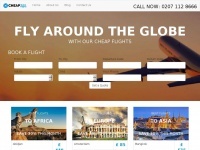 A total of 2 reviews for Cheapglobalflights.co.uk have been written yet. The most recent reviews are listed below. I want to express the amazing service experience delivered by the company. I had bought the ticket for Harare last summer, which was with the best price. I always look for a better deal in the quest to attain cheap flights global. I have worked out the fare by the company was the Cheapest Ticket to Zimbabwe. The communication and customer handling process were outstanding, that helped me save time and money to purchase. Server provider: Iceberg Telecom Ltd.